Simple ways to get your child thinking critically. Turning everyday tasks into learning opportunities with your children can greatly benefit them in the classroom. And STEAM education, which stands for science, technology, engineering, arts and mathematics, is a great way to get your kids to brush up on their critical thinking skills. Here are five ways to incorporate STEAM (or STEM) into fun activities without having to set foot outside. Science: Through this activity, children will become early scientists as they compare and contrast how the texture of vegetables changes throughout the cooking process. Technology: Ask: How does heat cook soup? How will you time the cooking? How do you keep veggies fresh before cooking? Have the kids think of the everyday uses of technology that help them and you make soup. In addition, have the children come up with different ways they might cook their soup if they didn’t have a stove. Engineering: Using a knife can promote an early engineering experience of a simple machine, such as a wedge. The discussion alone around the process of cooking is a wonderful form of engaging engineering skills. Art: Follow your soup-making process by reading a story! Our favorite is the story of Stone Soup by Marcia Brown. After storytime, invite children to draw a picture of their favorite part of making homemade soup. Math: Through cutting vegetables, children may learn halves or fourths, exploring fractions or simply counting and measuring. Adding spices and measuring the vegetable stock also provide opportunities for children to begin to understand the properties of measurement. Gather various water-safe objects that sink and float through exploring, observing and predicting. Why do some things float and some sink? What do you notice about the shape, weight and feel of the objects when they’re in the water? How does that change when you take them out? The science of turning raw ingredients into something mouthwatering. Make prepping a treat even sweeter with these tips and questions to incorporate into your kitchen adventures. Talk through measurements as you mix dry ingredients together. What do we predict will happen when dry ingredients are mixed in with the wet ingredients? What makes the batter change color? What do you think might happen when we bake the batter? What makes the batter go from wet to baked and delicious? Ease into a bedtime routine with flashlight shadows. Grab your flashlight and small objects, like a favorite stuffed animal, toys, or even a shoe, and see how many different ways you can make shadows move and play across the room. Place objects or your hand in front of the light and observe how shadows change and move around the room. Create a story about the object’s shadow. How do you make the shadows dance? How can we make the object look bigger or smaller? How many different ways can you make a shadow disappear and reappear in a different place? Bring the inner director out of your child. Cut off the top and bottom of the boxes. Help the children to tape paper across one of the openings. Ask: What else could we use to attach the paper? Place different objects in the box and light them from behind. Allow the children to select objects and have others guess what each object is while viewing from the other side. Encourage the children to experiment with moving the object and the light. Can you make the object look bigger? Ask children to think of other ways to make a shadow theater. What else could we use to let the light shine through? Do we need a frame? Allison Wilson is the Director of Curriculum and Innovation at Stratford School, a leading independent private school founded on the belief that education is a significant influence in the life of a child. She is passionate about developing teachers and students, bringing more than 15 years of experience to the early-childhood sector through teaching, school leadership, teacher training and innovative curriculum development. Stratford offers an accelerated, balanced curriculum from preschool through eighth grade with an emphasis in the areas of STEAM (Science, Technology, Engineering, Arts and Mathematics) that incorporates music, physical education, foreign language and social skills development. 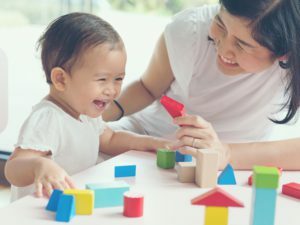 This article was written by Allison Wilson from Working Mother and was legally licensed through the NewsCred publisher network. Please direct all licensing questions to legal@newscred.com. STEAM learning (science, technology, engineering, arts and mathematics) has become a vital part of early childhood education. STEAM concepts help prepare children for life in the 21st century. After all, STEAM-related jobs make up one of the fastest growing segments of the U.S. economy (Baird-Remba, Guey, & Lubin, 2013). This is expected to increase over time as children eventually join the workforce. Here are five ways you can encourage STEAM learning at home. Take a field trip. Museums, zoos, aquariums, libraries and even public parks provide many opportunities to introduce STEAM subjects. Be sure to engage your child, ask her what she would like to see and ask whether she would like to learn more about what she has seen. Watch STEAM-related TV shows and movies. While screen time should not be solely relied upon for education, there are many ways it can help enhance your child’s learning experience. Things like documentaries and educational programming may strengthen your child’s understanding of STEAM subjects. Conduct experiments. Many fun and easy science experiments can be done at home with simple household items. You can find some ideas here. You can also help your child keep a journal of the experiments she completes and record what she learns from each one. Encourage questions. Children are naturally inquisitive, often asking “why?” or “how?” Following this thread of curiosity may lead to a STEAM subject which interests your child. If you don’t know the answer to your child’s question, research the topic with him. Ask your child what she would like to be when she grows up. Many careers are tied to STEAM learning. Help your child find out more about the field she wants to pursue and what she needs to learn to get there.